Centrifugal juicers are the most widely available juicer type and they also tend to be some of the most affordable juicers. These juicers produce juice by using a cutting blade to first chop up the produce and then spin the produce at a very high speed, sort of like how a washing machine wrings out the water from wet clothes. There is a strainer basket with little holes that allows the juice to pass through, while keeping the pulp behind. This unique spinning system combined with the cutting blade is what differentiates this type of juicer from the other electric juicers, which grind, press, or squeeze the juice. And this is what gives this type of juicer its unique pros and cons. Price. Affordable and easy-to-use - great for beginners and people who are short on juicing time. Easy to clean. Easier to clean than other electric juicers - which doesn't seem like such a big perk but really is. A tedious cleaning process can be the difference between fun juicing and a tedious chore. Quick and easy juicing. The juicing process is quicker - for the models recommended below, it's really easy to feed in even harder vegetables thanks to the cutting blade action. It takes pretty much no effort to feed items into the juicer. Less prep time. Takes in bigger chunks of fruits and vegetables than any of the other juicer types. Quick and easy juicing. Centrifugal juicers are the most common and as such, the easiest to find - you can pick one up in pretty much any department store. Single function. You can only juice. The single and twin gear juicers (below) can do a variety of fun things, like make pasta, sorbet, and even nut milk and butters. Centrifugal juicers ONLY juice. Louder. The spinning that centrifugal juicers use to extract the juice is FAST and convenient but it also can be loud. More waste, less juice. Centrifugal juicers generally tend to produce more waste than single or twin gear masticating juicers, but the amount of waste (juices still left in the discarded pulp) really varies by model. 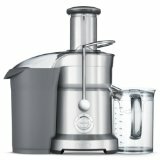 The cheaper models - like the Hamilton Beach juicer - is a great option in terms of price, but it also produces wetter pulp than the more high-end Breville juicers. Not for greens. Centrifugal juicers extract by grating fruits and veggies into little pieces and "spinning" the juice out of the pulp at high speeds (up to 10,000 RPM). This works great for harder, denser produce, but is ineffective at juicing leafy greens. Honestly, there is a lot of talk about the downsides of centrifugal juicers - mostly about the wasted produce (still-wet juicer pulp) and the oxidation that these juicers tend to produce. You see, the biggest drawback of centrifugal juicers is that the fast spinning process that makes these juicers so easy and convenient also produces heat and friction which causes slight foaming and faster oxidation in the juice so the juice really must be consumed as soon as possible. Result? You don't get the option to ﻿﻿store juice﻿﻿s made with centrifugal juicers for a few days, like you do with masticating or triturating juicers (those juices can last up to 72 hours). Another notable drawback is that centrifugal juicers are not-so-great at juicing soft fruits and vegetables (with the exception of higher-end Breville models, which are great for juicing soft fruits), as that tends to result in soft, mushy, wasted pulp. Just keep in mind that most centrifugal juicers are better for extracting juice from harder produce like carrots, apples, broccoli stems, etc. and opt for a Breville centrifugal juicer if you want to juice softer produce or a masticating juicer if you plan on juicing a lot of greens. Okay, all that being said - it's also good to keep in mind that centrifugal juicers tend to be very practical options. Sure, they may not extract every drop of juice from produce (like masticating or triturating juicers) but they are fast, efficient and incredibly easy to operate and clean. The convenience factor alone is a huge plus when you're trying to juice on very limited time. If you're going to get a centrifugal juicer, the Breville juicers are the best. 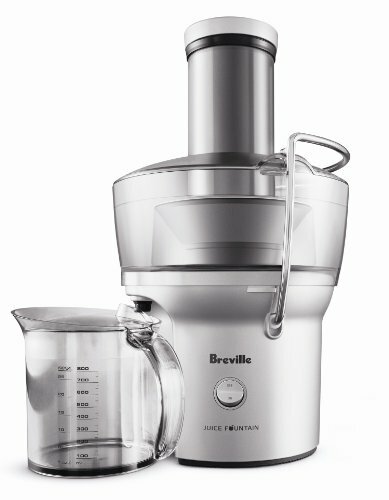 And out of the Breville juicers, the Breville BJE200XL Juice Fountain Compact Chrome Extractor is the absolute best value. This juicer goes for $99.99 on Amazon, making it one of the most affordable. It's also one of the easiest to put together and take apart for easy cleaning. Plus, it's quiet, fast, and has super convenient features like a wide feed chute that can take whole carrots and apples (no prep time :)). It also doesn't have the problems that the Hamilton Beach juicer (below) has, at least not to the same extent - the pulp produced by this juicer is much drier, although the juice is still a bit foamy, especially when juicing soft fruits. That being said, it does a superb job of juicing hard produce - it may not do a great job of juicing delicate greens and herbs, but you can definitely run the harder green veggies through it like celery, broccoli stalks, and cabbage. It can even handle softer fruit like peeled citrus fruits and tomatoes. Admittedly, this juicer is not the best juicer, but it is a good value. You can buy it for $70 on Amazon, which is as cheap as a great manual juicer (above). This juicer is a good starter juicer - it's fast and easy to use and clean up as well. It does its job well - it juices, but it does produce a fair amount of froth in the juice and the leftover pulp tends to be a little juicy. If you just want to try juicing to see if you'll like it, want a fast and easy juicer to use occasionally, or like putting the pulp back in your juice - this model could work really well for you. If you can afford it, this is hands down the best centrifugal juicer. If you want all the convenience and ease of a centrifugal juicer - no need to chop up veggies into small pieces, super fast feed-through of vegetables, immediate juicing, easy clean up - without the cons - unable to juice leafy greens and wasted pulp, this is the juicer to get. It is significantly more pricey - selling for a little over $300 on Amazon, but it offers all the ease and convenience that makes the centrifugal juicer awesome without its downsides. This is the best juicer in its class - extremely easy to use (can easily feed in produce both big and small), great for hard veggies as well as soft fruits and leafy greens, powerful and fast, and it can even make smoothies too (no need for an extra blender). Overall, if you can afford it - get this one. It's the best centrifugal juicer.